Image caption The ground floor and roof of the semi-detached property in Haslar Crescent were destroyed. A man has died in a fire which destroyed a house in Hampshire. 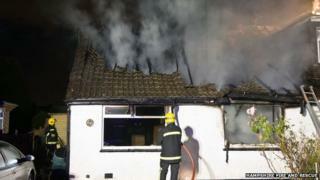 More than forty firefighters tackled the blaze which broke out at a bungalow in Haslar Crescent, Waterlooville, shortly before 03:00 BST. A fire service spokesman said they faced "arduous conditions and a fully developed" fire. The man, who has not been named, died at the scene. A joint investigation with police is under way. The victim's identity has not yet been confirmed.